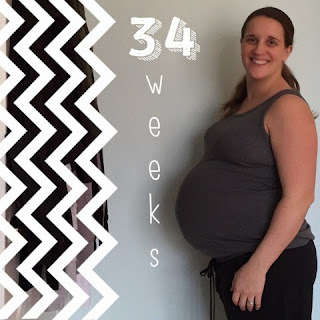 34 weeks! Less than 6 weeks to go! OHH EMM GEE. It's getting real folks (wait, I've been saying that for like 30 weeks. Gahhh. Broken record, I know, I knowwww). Anyways, I had my 33.5 week appointment and ultrasound on Monday this week. 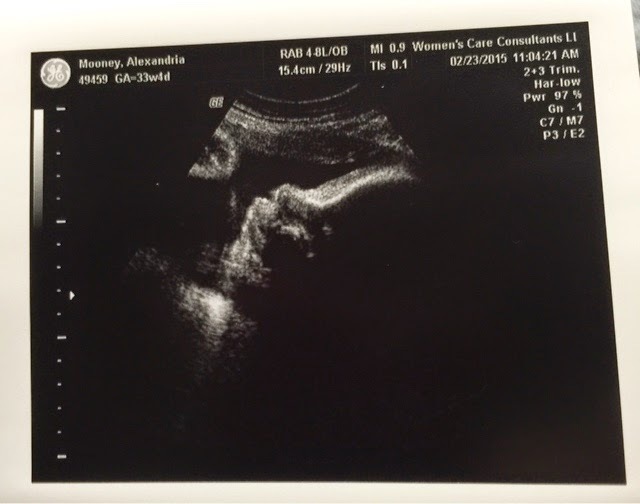 My speculations were almost correct--#2 is in the 89th percentile for size and measuring just a smidgen under 6 pounds. So yes, #2 is big...but, as I told many of my friends, is a smaller "big" baby than Patrick was. 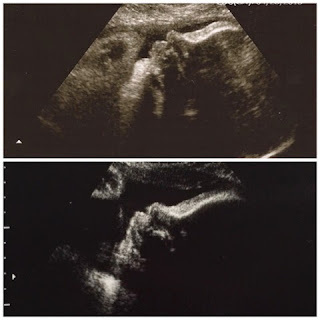 Here's a little comparison between Patrick (top) at 34 weeks and #2 (bottom) at 33.5 weeks. Kinda similar, eh?!! What's funny is that even though #2 is measuring big, he/she is not nearly as big as Patrick was at the same time (Patrick was over a pound bigger--over 7lbs at 34 weeks! )...so, even though this babe is big, it's not as big as Patrick was, which makes me think it's a girl (yep. Still thinking girl for #2!). 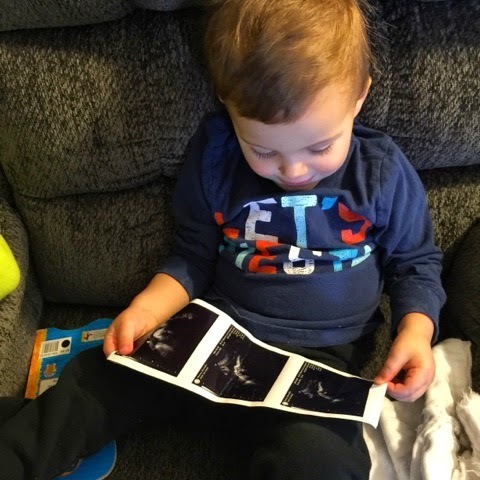 Awwww, how cute is Patrick checking out his baby brother or sister?! 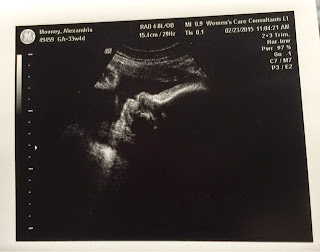 He did kiss the ultrasound pic a few times before he tried to crumble it. Haha. I don't really think he knows what's happening, but in less than 6 weeks, he most definitely will. His world is gonna be rocked. 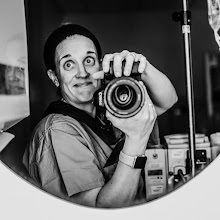 So at 34 weeks with Patrick I was put on modified bed rest and had to stop working (was already dilated and effaced) and I am happy to say nothing of the sort is happening (as of right now!) with #2. I'm feeling really great (I actually--shockingly--haven't gained a pound since my 29 week visit! WOOT!) and am hoping I can make it to my scheduled last day of work April 1st. This week has definitely cued some of the uncomfortableness that seemed to plague me allllllll of my third trimester with Patrick. Although mild, compared to what I remember feeling with him, I definitely have experienced some big time fatigue by the end of the day and some (upper) back pain. 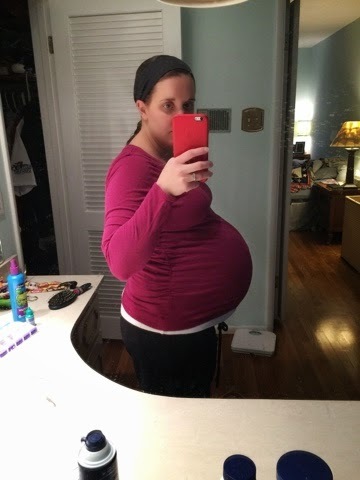 Being about 5.5 weeks out from my delivery date, I'm expecting this kind of pain and fatigue to be a daily occurrence and increasing in frequency, especially since #2 is so large. Regardless, I am determined to muscle through it and make it (still working!) up until my delivery date...so fingers crossed I can do that! That's about all I have to report for week 34...until week 35: adios!